Use the resources on the case study grids page to help you revise different elements of the GCSE Geography Course. Learning the important information, ideas and facts for each of your case studies is vital and a good place to start. The first step is to build up a set of notes which will support you in remembering the key facts and figures to support your analysis and evaluation in the exam. There is no one way to revise, but here are some tips to guide you in what you do. You need to create special time you set aside each day to revise - and it works best if you have a timetable. Revision is about breaking things down into chunks so you can go over them. You need to go over things again and again to get them into your long term memory. To make things more memorable use more than one sense if possible - and that includes stimulating different parts of the brain. So using colour and words together makes things more memorable. Be disciplined and do what you plan to do. Perservere - keep going when it gets tough. Doing lots of short bursts on each subject 20-30 minutes each over a number of days, is much better than one long session on one day. Reward yourself after you have done some hard work not before. 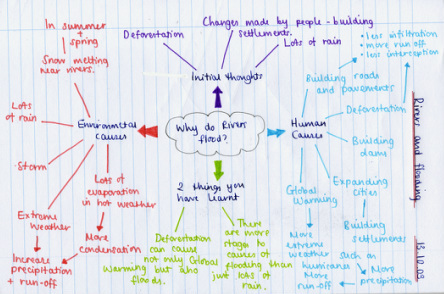 Mind Maps are excellent ways to break things down, to summarise and to use several senses - and so make things memorable. A really useful tool for revision is a memory trigger activity. This is a grid where you combine key ideas, with key words and then an image. This helps you to chunk down your revision, to link different sense and to reduce it to a digestible size so that you can keep going over it. These are very personal - as the things you pick out have to things you will remember and the image has to 'jog your memory'. Answer two questions. 30 minutes per question. 1 mark per minute. In each question you will have a choice of two case studies to answer. Answer this question you will have a choice of two case studies to answer. 1 mark per minute. You must answer all questions in this section. It will be split into parts. You will have to answer questions about a problem taking place somewhere in the world. You will be provided with all the information you need. You will be asked to look at different solutions, study different views and come up with your own solution. There is really clear guidance in the exam paper about how long to spend on each part of the paper. You should follow this advice, e.g.